In the last couple of years, Motorola didn’t release any new handsets in China, basically abandoning the smartphone market there. But now, after China’s Lenovo bought Motorola Mobility from Google, Moto is seemingly getting ready to make a comeback. 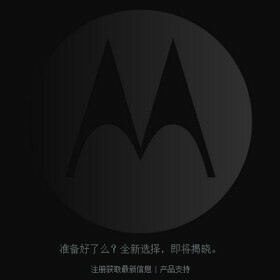 Motorola’s official Chinese website is informing us that new products are going to be announced in the near future. There’s no word on exactly what Motorola will introduce in China, but it’s said that two mysterious handsets - XT1079 and XT1085 - might be included. These are expected to feature LTE connectivity, but little else is known about them. Not long ago, we heard that Motorola would soon unveil a successor to the ultra-affordable Moto E, so perhaps this will be announced in China, too. Of course, Motorola might return to China only with already-announced handsets, like the second generation Moto X and Moto G. Or perhaps with the Moto 360 smartwatch? We’ll probably find out soon what all this is about, so stick around if you’re curious about Motorola’s Chinese comeback. Yep. The brand that is sold to different companies each year. that phase already started Punit Soni ,, man behind Moto x and Moto g left company after few months company sold to Lenovo which obvious was due to work changes he not wanted. Then CEO also quitted in April Now new CEO , after completing deal ,,, has said it clearly that they are coming with more options like others ..like Galaxy clones and also said that cheap LTE devices are going to be launched next year very aggressively in CHINA and INDIA.and that's possible only with the help of Lenovo cheap hardware and mediatek .Only preium will Moto Logo. Don't expect that level of quality of Mot X and Moto g now ,,, that time passed. We will see floods of Moto "LOGO" lenovo devices which will all lost in the ocean of mobiles. Only those which are less clones brothers and some exclusitivity left are standing their postion like Moto x, Moto G , One plus One , Xiaomi, Nexus and Iphones. Care to provide a link to where all this stuff was said, because I've been actively searching for this kind of information and haven't heard any of this stuff. LOL… Lenovo notebooks and convertibles are among the best, with great design and quality (see the Yoga line, or the thinkpads), and not cheap at all, by the way. That said, it is likely that Lenovo will have different marketing strategies from Motorola. I'm not saying they won't change the direction Motorola has taken, but you seem to be missing a major point. You said we all know how Lenovo is at mobile. Before the Motorola acquisition they were 4th in mobile, and are now 3rd after the acquisition. If they were completely inept, they couldn't get to that level. So they must have something going for them. And why would anyone compare screen quality to WiFi reception on a notebook? That's literally the definition of comparing 2 different things.